Google's Chromecast - you know, that thing whose popularity has the company feeling "completely overwhelmed" - has been updated with a host of new apps. "Chromecast has a little something for everyone in the family to enjoy, and today we're adding even more options for kids, music lovers and gamers," Google's Jennifer Wasson, who works on Chromecast partnerships, wrote in a blog post. These options include new Chromecast apps by Disney, iHeartRadio, Twitch, and DramaFever. The new apps are available now, so take a peek at chromecast.com/apps. 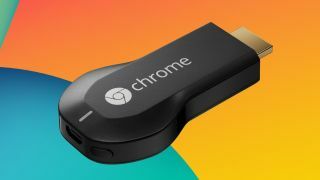 The last major update for Chromecast finally brought the Google dongle up to speed with Apple TV and AirPlay by giving it true Android screen mirroring. Today's new apps don't add any revolutionary new functionality, but more entertainment options can't hurt. From Disney, Chromecast gets the WATCH Disney, WATCH Disney Junior and WATCH Disney XD apps with various on-demand content, while Twitch's app adds game-streaming and viewing. The iHeartRadio Chromecast apps brings the service's 1,500 radio stations to the device, and Dramafever adds 15,000 episodes of international dramas. Chromecast recently got ABC and NPR apps as well, so now may be a good time to check the dongle out if a lack of content has ever stopped you in the past.